Looking to breathe new life into your scrapbook pages or Project Life layouts? The beauty is in the process. Interested in scrapbooking smarter, better, simpler, or with greater intention? PROCESS is the key. Yes, we’re talking about your personal creative process, that series of choices you must make to get from a lightbulb moment to a layout you adore. 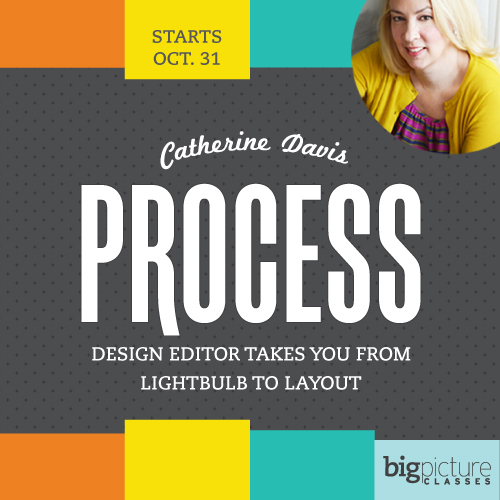 We’re also talking about PROCESS, a new 4-week workshop from “Design Editor” Catherine Davis. Catherine is a visual journalist who has designed pages at one of the nation’s top newspapers. She’s also a scrapbooker who blogs at designeditor.typepad.com and designsscrapbook layouts for both the Studio Calico and Becky Higgins’ Project Life creative teams. She’s here to share how she applies her years of professional design experience to scrapbooking. She’ll teach you to apply design fundamentals to your projects, no matter what your style. She’ll share her favourite memory-keeping techniques, design tricks, and inspiration sources. And she’ll do it all in her signature, highly visual teaching style. All you have to do is show up, read, watch, absorb, and create. As you accept and apply Catherine’s weekly challenges, you’ll find yourself opening up to a new world of insights—and refining your personal creative process so it works for you, instead of the other way around. * The first 400 students who complete registration for PROCESS with Catherine Davis will automatically receive a FREE Studio Calico mini kit (valued at $9.99) shipped to them in the mail, anywhere in the world. Kits will be shipped once a week while supplies last. Please allow 2-3 weeks for domestic shipments and 3-4 weeks for international shipments. These kits were designed exclusively for this class and will not be available for purchase. When they’re gone, they’re gone. How will you know if you’re one of the first 400 registrants? You’ll get an email notification within 10 days after you complete registration.